After almost 22 years Doom is finally finished thanks mod-maker Linguica's "InstaDoom", which adds 37 InstaGram filters to the game and swaps out the fabled BFG with a selfie stick. Available as a free download over at Doom World, "InstaDoom" gives players of the classic shooter a chance to take the battle to the next level by applying filters like "Ashby", Lo-Fi" and "Valencia". Once the filter is applied, players can rush through the first level to the location that once held a chainsaw but now holds the legendary Selfie Stick. 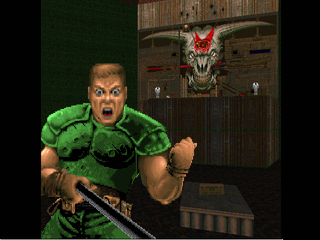 Linguica swapped out chainsaw and BFG locations throughout the game, and replaced the powerful projectile weapon with a stick with a pixel rendition of Doomguy on the end. The results speak for themselves. The Golden Age of Doom Photography is upon us. All hail Linguica.